Lignan biosynthesis is catalysed by oxidative enzymes. In the test tube the reaction results in a heteregenous mixture of dimeric compounds. When dirigent protein is present during the reaction, one stereoisomer of one compound is highly enriched. Dirigent proteins appear to possess no oxidative radical forming activity of their own; in the absence of oxidative enzyme, no reaction will occur. Recently, a second, enantiocomplementary dirigent protein was identified in Arabidopsis thaliana, which directs enantioselective synthesis of (-)-pinoresinol. In lignan biosynthesis, oxidative enzymes perform proton coupled electron transfer to remove a hydrogen atom from monolignols, forming a radical intermediate. These intermediates then couple in a radical termination reaction to form one of a variety of dimers, known as lignans. In vitro reactions of coniferyl alcohol (a common monolignol) in the presence of oxidative enzymes produce a wide variety of different dimers at varying concentrations. When dirigent protein from "Forsythia intermedia" is present, production of (+)-pinoresinol is greatly enriched, and other products are far less abundant. Because this enrichment is so pronounced, the enzyme is hypothesized to produce (+)-pinoresinol exclusively, and to compete with the non-protein-mediated coupling reaction, which produces a heterologous mix of products. This has been confirmed by analyzing the various mixtures produced with different concentrations of dirigent proteins present. The mechanism by which this stereoselectivity is achieved is not well-understood at this time. However, since no reaction proceeds in the absence of oxidative enzymes, dirigent protein does not itself appear to catalyze the oxidation of coniferyl alcohol to form radicals. In the presence of dirigent protein from Forsythia intermedia, production of (+)-pinoresinol is greatly enriched while production of other products of dimerization is inhibited. 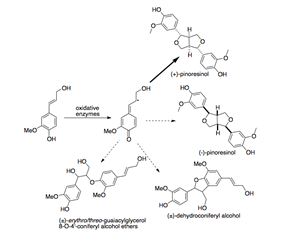 The activity of dirigent protein from Forsythia intermedia is specific to coniferyl alcohol. When other monolignols, such as p-coumaryl alcohol and sinapyl alcohol, are reacted in vitro with oxidative enzymes in the presence of dirigent protein, they produce a heterologous mixture of products indistinguishable from identical experiments in the absence of dirigent protein. Circular dichroism experiments have shown that the secondary structure of dirigent protein from Forsythia intermedia is composed primarily of β-pleated sheets and loop structures. The tertiary structure has not been solved, but the protein has been confirmed to be dimeric. Each dimer has a single binding site for coniferyl alcohol, for a total of two binding sites. One coniferyl alcohol can bind to each site, so that the reaction geometry between the two is confined, increasing the production of (+)-pinoresinol and inhibiting the production of other products. In the absence of dirigent protein, pinoresinol is a relatively minor product of lignan biosynthesis. When dirigent protein is present, it becomes the major product. The biological significance of (+)-pinoresinol in plants is not fully understood, but it has been found to be effective as a feeding deterrent against ants in caterpillars of the cabbage butterfly, which obtain the compound from their diet. It may serve a similar defensive purpose in Forsythia intermedia. ^ Nicholson, Ralph L.; Wilfred Vermerris; Vermerris Wilfred (2006). Phenolic compound biochemistry. Berlin: Springer. pp. 107–108. ^ Davin LB, Wang HB, Crowell AL, et al. (1997). "Stereoselective bimolecular phenoxy radical coupling by an auxiliary (dirigent) protein without an active center". Science 275 (5298): 362–6. ^ Ward R.S. (1982). "The synthesis of lignans and neolignans". Chemical Society Reviews 11: 75–125. ^ Fournand D, Cathala B, Lapierre C (January 2003). "Initial steps of the peroxidase-catalyzed polymerization of coniferyl alcohol and/or sinapyl aldehyde: capillary zone electrophoresis study of pH effect". Phytochemistry 62 (2): 139–46. ^ Davin L.B., Lewis N.G. (August 2005). "Dirigent phenoxy radical coupling: advances and challenges". Current Opinion in Biotechnology 16 (4): 398–406. ^ Pickel B, Constantin M-A, Pfannsteil J, Conrad J, Beifuss U, Schaffer A (March 2007). "An Enantiocomplementary Dirigent Protein for the Enantioselective Laccase-Catalyzed Oxidative Coupling of Phenols". Angewandte Chemistry 53 (4): 273–284. ^ Sarkanen, Simo; Lewis, Norman (1998). Lignin and lignan biosynthesis. Columbus, OH: American Chemical Society. ^ Halls SC, Davin LB, Kramer DM, Lewis NG (2004). "Kinetic study of coniferyl alcohol radical binding to the (+)-pinoresinol forming dirigent protein". Biochemistry 43 (9): 2587–95. ^ Kim, M.K., Jeon J-H, Fujita M, Davin L.B., Lewis N.G. (2002). "The western red cedar (Thuja plicata) 8-8′ DIRIGENT family displays diverse expression patterns and conserved monolignol coupling specificity". Plant Molecular Biology 49 (2): 199–214. ^ Halls SC, Lewis NG (July 2002). "Secondary and quaternary structures of the (+)-pinoresinol-forming dirigent protein". Biochemistry 41 (30): 9455–61. ^ Schroeder FC, del Campo ML, Grant JB, et al. (October 2006). "Pinoresinol: A lignol of plant origin serving for defense in a caterpillar". Proc. Natl. Acad. Sci. U.S.A. 103 (42): 15497–501. ^ Schmitt J, Peterson M (2002). "Pinoresinol and matairesinol accumulation in a Forsythia × intermedia cell suspension culture". Plant Cell, Tissue and Organ Culture 68 (1): 91–98.